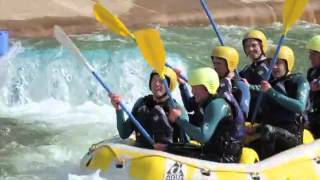 White Water Rafting is an exciting activity that is guaranteed to satisfy even the wildest adrenaline junkies in your hen party. Thankfully, you no longer need to hop on a plane to experience the thrill of wild rapids as white water rafting is now available in the centre of Cardiff! Your party will be tackling grade 3 rapids at a state of the art rafting centre that is just minutes from the centre of Cardiff. You will be blown away by the man-made river that uses cutting edge technology to create frightening rapids that will put your nerves to the test. Each raft will carry up to 6 people plus an instructor. Listen carefully to his commands and work as a team and he will guide you through the torrents. Ignore him and you could be taking an early bath!